Not your typical pairing but it works! A funny thing happened during our recent road trip to Minnesota...we discovered the Spam Museum! Yes, just like there's a website for just about everything, there's a museum for Spam! Hormel Industries, the makers of Spam have a wonderful museum in Austin, Minnesota just off Interstate 90. Admission is free. You get to watch a great movie that covers the history of this world-famous mystery meat in a can. The museum is well worth the stop. 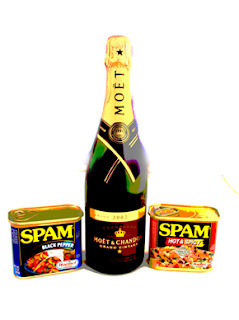 Plus you can get to purchase new Spam logo items and new Spam flavors (including Hot & Spicy and Pepper) that are not yet available in the stores. We brought samples of The Hot & Spicy Spam, which is seasoned with Tabasco sauce. I am not a fan of Spam, but this was delicious in a grilled cheese sandwich.